← Farewell, Ann Arbor News – We spent some good times together! Apple does not rely on focus groups. This doesn’t mean you shouldn’t use focus groups, but it does lead to an important point: Apple is sure of its brand. Apple has had a tumultuous history. Today, the company has a solid brand, direction and products that people clamor for. “Pirates” came out in 1999 – two years before the launch of the iPod, which has had a huge impact on, well, everything. Learning lessons, it seems, Apple solved the database challenges of iTunes, delivered an easy-to-use interface for both the computer and the iPod, found a price point that worked – and, most importantly, nailed it on the marketing piece. Delivering at the right time and place certainly helps, but the brand of Apple seemed to have evolved to Passion, Vision and Execution. Still, I believe that focus groups can be helpful. As a “company therapy” process, you can get a sense of how your brand is perceived among your current or potential customers. 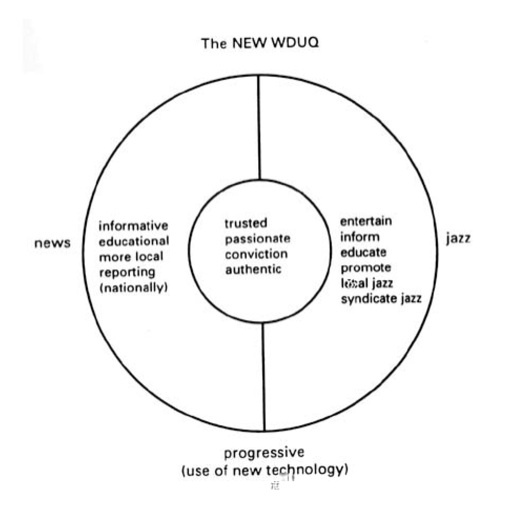 At my public radio station, WDUQ, Pittsburgh, we learned that both our NPR news brand and our jazz brand were core to our identity and a part of what people found admirable about us. The group that helped us with this evaluation were bright 20-somethings under the leadership of Dr. Robert Swinehart of the School of Design at Carnegie Mellon University. They liked us – they really liked us! And it was. But not about news, or jazz or intelligent talk or whatever. If you look at the 1998 era graph put together at the end of the CMU project, the core was about trust, passion, conviction and authenticity. We often confuse Brands with formats or devices or the “thing” of the moment. Yet, if we go too far in “extension,” we no longer have a core to be passionate about. In looking at what these young eyes had seen in us, and looking in the mirror, we saw that we had something that could work. Focused enough to fit our sensibilities and experience, yet broad enough to stretch us. A challenge that looked to be worthwhile and fun. Armed with the information and confidence that WDUQ had some unique, positive traits, the next step was execution fueled with growing passion. Over the course of the next decade, we worked to deliver quality news and jazz programming, partnering on a high level with scores of other like-minded groups and individuals in Pittsburgh to build and grow our civic and cultural goals. Our staff jumped in to the telling of our story, our vision – to brand and market what we were about, including great work with Fitting Group. A bit more than a decade later, WDUQ doubled its total audience. The jazz “side” of the station has more listeners than the whole station served in 1996. The news “side” of the station is among the the most diverse in the country, indexed against our market demographics. Yet, for our listeners, the station has no sides, really. The brand of WDUQ is of a non-profit media outlet that reaches out, everyday, across a diverse array of people, activities and ideas. We have a vision for an engaged, aware Pittsburgh that connects with the world, and we hustle to live up to that vision, every day. To get love back from your customers, passion helps a lot. But, in the end, great brands deliver. This post was adapted from a guest blog post written for the Fitting Group. This entry was posted in Apple, Bill Gates, branding, Carnegie Mellon University, Focus Groups, marketing, Pirates of Silicon Valley, Pittsburgh, Scott Hanley, Steve Jobs, WDUQ. Bookmark the permalink.